All 2019 NSX models are distinguished by a palette of new colors, a new body-colour front grille garnish (previously silver) and high-gloss treatments for the front grille surround, front air intake mesh and rear bumper outlet mesh. High-gloss treatment is also applied to the available Carbon Fiber Decklid Spoiler and Carbon Fiber Exterior Package – including a front chin spoiler, side sill garnish and rear diffuser.
. The available semi-aniline full leather (non-Alcantara) power sport seats can now be optioned in Red in addition to Ebony. Power sport seats (4-way), previously a $1,800 option, are now standard equipment. Lightweight manually adjustable sport seats, wrapped in Black Milano leather and Alcantara, remain an available no-cost option. Satellite-Linked Navigation, ELS Studio® premium audio, front and rear proximity sensors and aluminum sport pedals, previously optional equipment, are now standard. 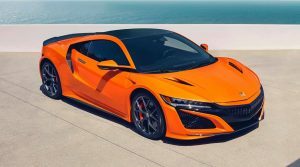 For the 2019 model, engineers modified chassis components, tires and software tuning to make NSX even more responsive to the will of the driver. The 2019 NSX is powered by a Sport Hybrid SH-AWD® power unit consisting of a twin-turbocharged mid‑mounted V6 engine paired with a 9-speed dual clutch transmission (9DCT). An electric Direct Drive Motor integrated with the engine and 9DCT supplements the engine with instantaneous electric torque. Containing two additional electric motors, the front-mounted Twin Motor Unit (TMU) continuously varies torque—both positive and negative—to the left and right front wheels to enhance handling precision and cornering capabilities, elevating any driver’s confidence and performance. Maximum peak system output is 573 horsepower and 476 lb.-ft. of torque. The race-winning, carbon fiber NSX GT3 is also offered for sale; certified to compete in more than a dozen FIA-sanctioned racing series around the world. More information on the NSX GT3 can be found at AcuraClientRacing.net.